The global medical waste management market was valued at over 10 Bn in 2016 and is expected to expand at the CAGR of above 5% during the forecast period of 2017 to 2025. Increase in incidence and prevalence of infectious and life style diseases, rapidly growing population, rise in healthcare expenditure, and adoption of novel technologies to treat the diseases are the major factors responsible for rise in the generation of medical waste. According to World health Organization (WHO), developed regions about 0.5 kg of hazardous waste per hospital bed per day; whereas developing regions generate on average 0.2 kg. Stringent regulations and rising health care costs leading to outsourcing of waste management, initiatives by governments and non-government organizations (NGOs) to manage medical waste, and technological advancements in the methods of waste disposal are the factors expected to drive the medical waste management market growth during the forecast period. However, lack of awareness about proper methods of waste segregation among healthcare workers, and high initial capital investment required to establish a medical waste disposal facility are the factors restraining the medical waste management market. The global medical waste management market has been segmented based on nature of waste, waste types, waste generator type, types of services provided by the players, and by geography. In terms of nature of waste, the global medical waste management market has been segmented into non-hazardous medical waste and hazardous medical waste. The non-hazardous medical waste was estimated to hold maximum market share in 2016. However, the hazardous medical waste segment is anticipated to grow significantly faster during the forecast period. According to World health Organization (WHO), non-hazardous and hazardous waste contributes 85% and 15% of the total medical waste generated respectively, among these, the non-hazardous waste is not properly separated owing to low awareness in low income countries making the real quantity of hazardous waste much higher. In terms of waste type, the global medical waste management market has been segmented into sharps, infectious & pathological waste, radioactive waste, pharmaceutical waste, and non-infectious waste. The non-infectious or general waste segment is estimated to dominate the market in the year 2017, whereas infectious & pathological waste segment is expected to grow at significantly rapid rate by the year 2025. According to WHO, improper management of sharps waste such as unsafe injections across the world, was responsible for 33 800 new HIV infections, 1.7 million hepatitis B infections and 315 000 hepatitis C infections, in the year 2010. In terms of waste generator types, the market is divided into large quantity medical waste generators and mid and small quantity medical waste generators. Increasing number of mid and small quantity medical waste generators and increasing focus of leading players on this group of waste generators are the factors expected to boost the growth of this segment by the year 2025. The large quantity medical waste generators segment is expected to dominate the global medical waste generators market owing to rapidly increasing number of hospitals and pharmaceutical and biotechnology companies. The mid and small quantity medical waste generators segment is anticipated to expand at highest CAGR during the forecast period. Geographically, the global Medical Waste Management is segmented into North America, Europe, Asia Pacific, Latin America, and Middle East & Africa. North America dominates the global medical waste management market owing to highest use of biomedical technologies and products, rapidly aging population, increasing healthcare expenditure, stringent laws for medical waste management, and highest awareness about safety and security of the public health and environment. Europe held second largest market in the year 2016 in the global medical waste management owing to increasing prevalence of infectious and lifestyle diseases, growing adoption of advanced medical technologies leading to increased diagnosis and treatment of various diseases, and presence of large number of healthcare waste generators in the region. Major players operating in the global medical waste management market includes CLEAN HARBORS, INC., Stericycle, Waste Management, Inc., Republic Services, Inc., Sharps Compliance, Inc., Veolia, Daniels Health, US Ecology, Inc., BioMedical Waste Solutions, LLC., and BWS Incorporated. The emerging players in the global medical waste management market includes ALBA Services GmbH & Co. KG, SUEZ, GRP & Associates, Inc., among others. The key players are expanding their service portfolio by applying strategies such as mergers and acquisitions; new service launches such as mail back system; and expanding geographic reach with enhanced facility and distribution network. For instance, in August 2016, Sharps Compliance, Inc., received approval for its new facility in Northeastern Pennsylvania, U.S. This facility includes medical waste treatment, and a transfer station for pharmaceutical waste. This research study analyzes the global market for medical waste management in terms of revenue (US$ Mn). For the research, 2016 has been considered as the base year and 2015 as the historical year, while all forecasts have been provided from 2017 to 2025. The global medical waste management market has been studied on the basis of nature of waste, waste types, waste generator types, and types of services provided by the players operating in the global medical waste management market. The global medical waste management market report comprises an elaborate executive summary that provides overall information about various segments of the market. The report provides a detailed competitive landscape, by major players operating in this market along with their shares (value %) of the global medical waste management market for 2016. The report also provides detail company profiles of emerging market players operating in the global medical waste management market. The market overview section comprises impact factors such as key market dynamics including drivers, restraints, and opportunities, affecting the demand for medical waste management services in the global market. These factors would aid the stakeholders in establishing a strong foothold in the global medical waste management market. Furthermore, the market overview section comprises key industry events, product overview, and market attractiveness analysis in the global medical waste management market. The market attractiveness analysis provides a graphical view comparing the growth and market dynamics in various segments and countries to identify the most attractive market. The global medical waste management market has been segmented based on nature of waste, waste types, waste generator types, types of services provided by the players, and by geography. In terms of nature of waste the global medical waste management market has been segmented into non-hazardous medical waste and hazardous medical waste. In terms of waste types, the global medical waste management market is segmented into sharps, infectious & pathological waste, radioactive waste, pharmaceutical waste, and non-infectious waste. In terms of waste generator types, the market is divided into large quantity medical waste generators and mid & small quantity medical waste generators. The large quantity medical waste generators includes two subsegmnets such as hospitals and pharmaceutical and biotechnological companies. The hospitals segment is further classified into public hospitals and private hospitals. The mid & small quantity medical waste generators segment is categorized into clinics and physician’s offices, retail pharmacies, ambulatory surgical centers & long term care centers, laboratories, academic and research institutes, blood banks, and others (veterinary, mortuary and autopsy centers, home healthcare, military & government, nursing homes, tattoo parlor). The laboratories segment is further classified into pathological laboratories and diagnostic laboratories. Geographically, the global medical waste management market has been categorized into North America, Europe, Asia Pacific, Latin America, and Middle East & Africa. Moreover, analysis for the major countries comprising U.S., Canada, Germany, France, U.K., Italy, Spain, Russia, China, Japan, India, Australia & New Zealand, Brazil, Mexico, South Africa, Israel, and GCC countries have also been provided in the report. 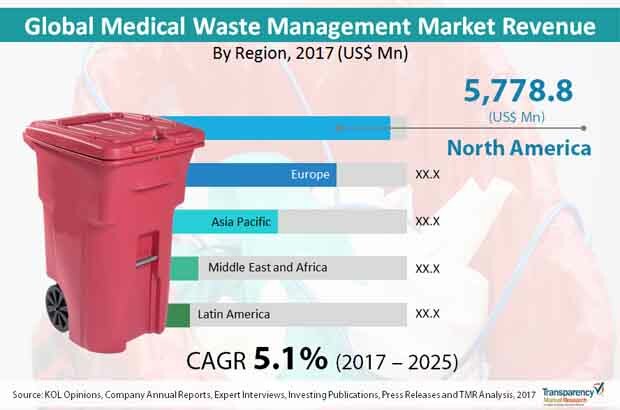 A detailed qualitative analysis of the factors responsible for driving and restraining the growth of the medical waste management market in various regions has been provided in this section. The report provides a detailed outline/blueprint of the medical waste management market globally that will assist new companies in establishing their presence and market players in expanding their market share in the market. The report concludes with the company profile section which includes company overview, financial overview, SWOT analysis, product portfolio, business strategies and recent developments for market players. Major players operating in the global medical waste management market includes CLEAN HARBORS, INC., Stericycle, Waste Management, Inc., Republic Services, Inc., Sharps Compliance, Inc., Veolia, Daniels Health, US Ecology, Inc., BioMedical Waste Solutions, LLC., and BWS Incorporated. The emerging players in the global medical waste management market includes ALBA Services GmbH & Co. KG, SUEZ, GRP & Associates, Inc., among others.